Apple has shown interest in combining the use of its Touch ID fingerprint sensor with rotating or moving a user's fingertip in specific ways, offering even more advanced security on future iPhones and iPads. 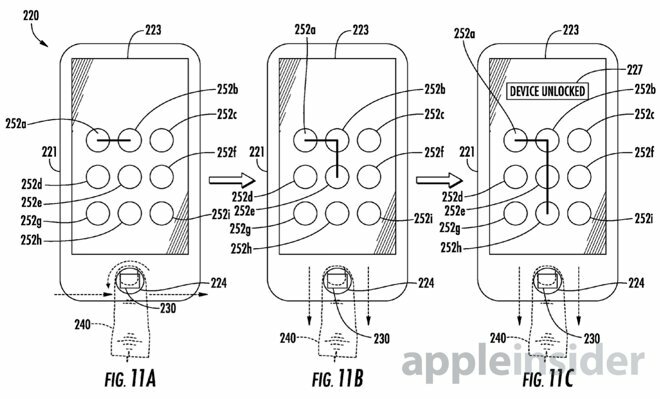 The concept was revealed this week in a new patent application credited to Dale R. Setlak, co-founder of AuthenTec, the company acquired by Apple to power its Touch ID fingerprint sensors. Entitled "Electronic Device Switchable to a User-Interface Unlocked Mode Based Upon a Pattern of Input Motions and Related Methods," the newly published filing describes how the Touch ID sensor could interact with a user interface to allow users to unlock their device. In one example, a user is shown rotating their finger to move a corresponding digital combination lock displayed on the iPhone screen. 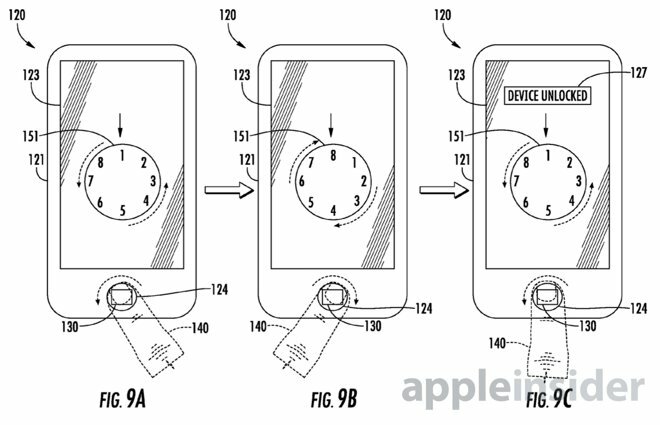 In the filing, Apple reveals that its virtual combination lock would be responsible to a pattern of input motions that must be completed by the user to securely unlock the device. In another example, a traditional "swipe pattern" is displayed on the screen. But instead of interacting with the display, a user drags their finger across the Touch ID home button to securely unlock the device. The filing only serves to spotlight the fact that the Touch ID home button found on the latest iPhones and iPads can be used for much more than just sensing a user's fingerprint. The technology acquired by Apple allows for the button to sense movement and motion of a user's finger, which could allow unique input methods in the future. This has already been achieved in a subtle way with the iPhone 6 and iPhone 6 Plus, both of which boast a new feature called "Reachability," allowing the user to tap but not press the home button twice to bring the top portion of the screen down so that it can be reached with one hand. Because the Touch ID button is always "sensing" in the iPhone 6 and iPhone 6 Plus, touching it alone can keep an iPhone display from going into idle mode and locking— something that doesn't occur with the smaller iPhone 5s, which lacks Reachability. The Touch ID fingerprint sensor is powered by the "Smart Sensor" technology that Apple acquired from AuthenTec. The Touch ID predecessor could be used to provide touch-based navigation, offering precise cursor control when editing text, optical joystick emulation, a fast scrolling feature, and more. Touch ID's ability to identify different fingerprints could also be utilized to enable users to quickly initiate different tasks, such as launching specific apps or calling a particular contact, by using different fingers. Setlak's proposed input motion unlock invention was made public this week by the U.S. Patent and Trademark Office. It was first filed with the office in June of 2013.